Pentangle’s primary venue, the Woodstock Town Hall Theatre is busy 250 days per year presenting a diverse selection of vibrant events serving more than 20,000 patrons annually. From its opening on October 12, 1900 the building has served as the centerpiece of cultural excellence for both the town and the surrounding communities. Originally known as Woodstock Opera House it featured a large banquet hall on its first floor and a Victorian style Opera House on the second. At the time, it was considered as “the best that could be found in similar buildings in Boston or any other cultural center”. The Town Hall Theatre now features a neoclassical proscenium design with 386 seats, a raked floor, and outstanding natural acoustics. A gem in our small community the town hall theatre remains a vital gathering place for friends, neighbors, and visitors to share camaraderie and world-class entertainment. Rentals: From musicals to weddings and birthday parties, the Woodstock Town Hall Theatre is available to rent. For more details, give us a call at (802) 457-3981. Woodstock’s Historic Town Hall is wheelchair accessible. Use the automatic door on the east side of the Town Hall, then take the elevator to Level 1 for theater access, ticket office, reserved tickets. Restrooms can be found at Level B. Don’t hesitate to ask one of our friendly ushers for help. The seating layout inside Town Hall Theatre always includes a reserved selection of Wheelchair and Wheelchair Companion seats. 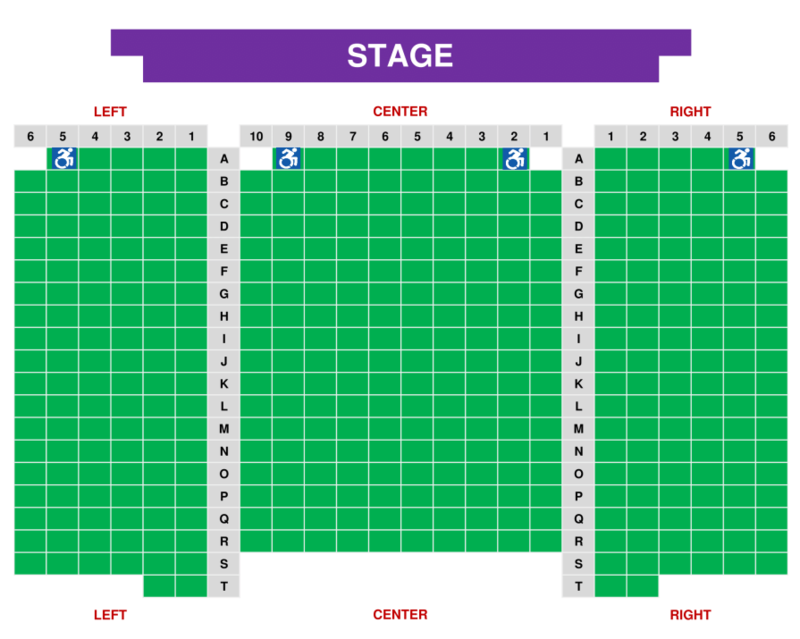 All are located in the first row, and can be seen on our seating chart here. These seats are available to reserve on a first-come, first-served basis, so advance purchase is highly recommended — please call us at 802-457-3981 or email us at [email protected] and we will be delighted to assist you. For movies or other general-admission events, these seats are also first-come, first-served — feel free to ask our theatre manager, ushers, or any staff member for assistance. You may also request assisted listening devices or large-print programs when ordering your tickets. Assisted listening devices can also be requested at the door (however, we do ask that you try to make your request sufficiently in advance of the event start time so that we have a relaxed opportunity to help you get oriented to the equipment).